If you queued up the new Bon Iver songs expecting the serene, quiet folk that catapulted them to indie stardom five-plus years ago, you were probably a bit disoriented upon first listen. “22 (OVER S∞∞N),” the first of three tracks released before the new album, 22, A Million, drops on September 30th, begins with chipmunk-pitched vocals and no acoustic guitar on the scene. It’s a jarring way for the band to return after five years, to say the least. They are going for fresh sounds and ideas about what a song can be — and subverting their fans’ expectations while they do it. However, despite this Kid A-esque turn, these new songs still somehow feel 100% like the Bon Iver we’ve come to know. First of all, what’s the deal with these insane, wingding-looking song titles? Numerology and symbols are clearly a main theme of 22, A Million. Each song title features a number and the album cover is cluttered with various, seemingly random symbols: a rainbow, a pyramid, a stuck-out tongue, several crucifixes, an upside down chair. 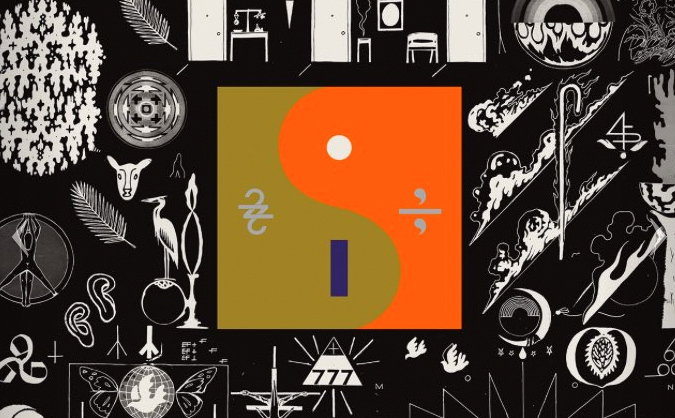 In the letter accompanying the album announcement, Trever Hagen, a friend and collaborator, says “22” represents lead singer and creative mastermind Justin Vernon, while “A Million” represents the rest of the world. This sentiment is, of course, baked into the lyrical content of the new tunes. Regardless of its strangeness, Vernon’s writing style remains close to what it was in the first two Bon Iver records. In 22, A Million, he continues to mix the banal and everyday with the abstract and esoteric. On “33 ‘GOD'” (33 was Jesus’ age at his death, the song also runs 3 minutes, 33 seconds) he smashes together the line “We find God and religions to” with “Staying at the Ace Hotel”. On “22 (OVER S∞∞N)”, lyrics like “So as I’m standing at the station” share real estate with “There isn’t ceiling in our garden”. The second track on the album, “10 d E A T h b R E a s T ⊠ ⊠”, features lines like “Unorphaned in our northern lights” and, my personal favorite, “Fuckified”. The result are songs that play like sacred memories we don’t have. Just like Bon Iver Bon Iver‘s “Holocene”, where we hear about “That night you played me ‘Lip Parade'”, a memory of Vernon’s that comes right before the soupy obscurity of “Not the needle, nor the thread, the lost decree”, concrete elements of nostalgia are mashed together with mystifying lyrical content. However, it’s the anthemic universal lines that shine the brightest in Bon Iver’s music. On “Holocene”, it’s the refrain, “…And at once I knew I was not magnificent”, where we can all cosign that feeling of insignificance in the face of something far greater than ourselves. “22 (OVER S∞∞N)” begins with “Where you gonna look for confirmation?”, a question of where we all turn for validation and fulfillment. While that classic Bon Iver lyrical presence remains, the new soundscapes on these tracks are certainly pushing the envelope. Straightforward acoustic folk will probably not be found much on 22, A Million. This is scattered, unconventional, and unpredictable music that doesn’t sound like much else out there today. There’s more electronic influence and way less guitars and drums. You can kind of hear the Kanye West impact (Vernon has collaborated with Kanye on multiple occasions), especially on the charging, aggressive (for Bon Iver, that is), and enigmatic Yeezus-inspired “10 d E A T h b R E a s T ⊠ ⊠”. Another likely area of Kanye’s influence is Bon Iver’s use of samples. While sampling has been popular in hip-hop for decades, you don’t hear it much in other genres, especially as liberally as Bon Iver have sampled other songs here. Unsurprisingly, the choices are wide-ranging, including a country artist from the 50s, a gospel group from the 80s, and a contemporary Scottish singer-songwriter. The most high-profile sampled artist is Stevie Nicks, but Vernon didn’t choose “Edge of Seventeen,” no, he decided to sample from his “favorite YouTube video of all time,” an old clip of her warming up backstage. These samples don’t overwhelm the songs, they simply add texture on the peripheral edges. Either way, it feels like a legitimately innovative move from an indie folk artist. And yet, even with the fresh sound and all the samples, you can nevertheless hear the recognizable thread of For Emma and Bon Iver, Bon Iver at work. Of course, let’s not forget, there was significant change between Bon Iver’s first and second albums. After the stripped-down success of For Emma, Vernon wrapped his original sound in layers of gorgeous instrumentation for the second record, adding delicate saxophones, trumpets, and strings. Auto-Tune was even used to unusually excellent effect, so Bon Iver is no stranger to innovation and artistic growth. On these new tracks, that Bon Iver flavor remains. Lovely piano keys form the base of “33 ‘GOD’,” while what sounds like a banjo enters around the one-minute mark. Early on in “22 (OVER S∞∞N)” a patiently plucked guitar emerges to guide us into the album. Then, thrillingly, a sax solo comes in out of nowhere around the middle of the song. Of course, Vernon’s vocals are at the forefront as usual — that beautifully distinct falsetto, the powerful low register, and the Auto-Tune-enhanced vocal magic; it’s all there. Right now, it’s uncertain how fans (especially the casual ones) will receive 22, A Million. At first, the new material tends to sound disjointed and colder than the previous two albums. It’s only after a few listens that the songs start to connect and reveal their rewards. The melodies begin to take hold once you get a feel for where the band is going. It’s definitely an exhilarating new direction, but once you listen a little closer, it’s still Bon Iver, after all.